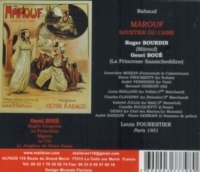 "MAROUF is based on a tale from the ARABIAN NIGHTS. The title character, as drawn by Rabaud and his librettist Lucien Nepoty, must certainly be one of the most passive protagonists in operatic literature! Our Cairene cobbler isn't ambitious, clever, or brave. Rather he trusts to luck, or perhaps the will of Allah. When his 'Calamitous Spouse' drags him before the law for beating her, though innocent, he accepts his punishment without a word in his own defense. He does at last choose to flee the harpy, and takes to the high seas with a group of mariners. But shortly thereafter he finds himself beaten and robbed far from home. It is a preposterous story that is meant to amuse, rather than to move the emotions. 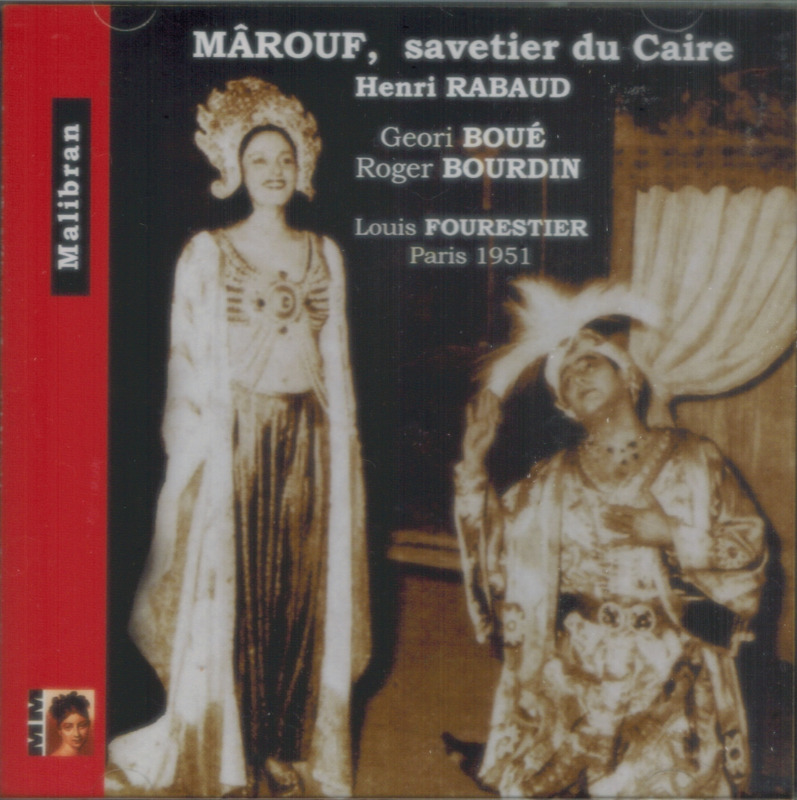 In fact Marouf's servile manner and vocal lines filled with endless sing-song arabesque started grating on me after a bit - that is, until I encountered his beguiling 'Saamcheddine'! The couple's Act 3 love duet is perhaps the musical high point of the opera. 'Modernism is the enemy' was a favorite dictum of the Rabaud's, so it's no surprise that his opera has little in common with the works of such near contemporaries as Arnold Schönberg or even his compatriot Maurice Ravel. There's hardly a hint of the desperate passions found in contemporary verist works either, such as Zandonai's FRANCESCA DA RIMINI or Montemezzi's L'AMORE DEI TRE RE. 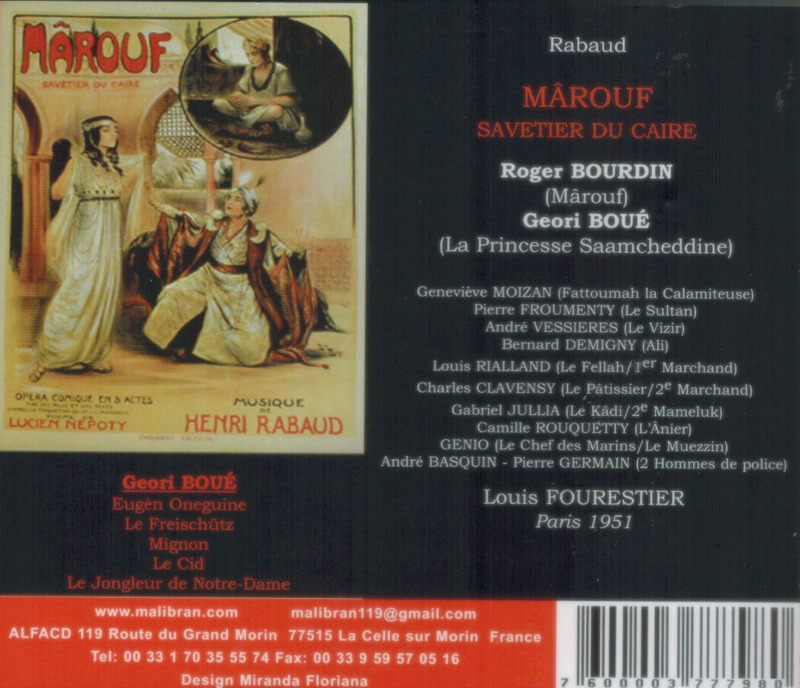 Rather the name which most often springs to mind while listening to Marouf is that of his professor, Massenet--especially in that composer's lighter and more fanciful moods, found in operas like ESCLARMONDE or CENDRILLON. Like Massenet, Rabaud's music is suave, melodious, and meticulously crafted. Everything is paced with an astute sense of proportion. But the observant ear will also detect many fascinating 'twentieth centuryisms' - hints of Straussian and Debussian harmonies that delight the ear and set his music apart from that of his more famous teacher. He also boasts a formidable orchestral technique. Rabaud's opera doesn't aim for the heavens, but it achieves its more modest goals with such ease and facility that one cannot help but feel a certain delight in it." "Geori (Georgette) Boué made her Paris debut at the Opera-Comique in 1939, as Mimi in LA BOHEME (singing in the 1,000th performance at the Salle Favart on 3 May 1951), and other roles there included: Lakme, Manon (singing in the 2,000th performance on 18 January 1952), and Ciboulette (first performance at the Opera-Comique). In her HERODIADE, Louise, Gilda, Violetta, Desdemona, Tosca, Madama Butterfly, Tatiana, etc. Boue had a clear voice of considerable power, renowned for her impeccable diction, she was widely regarded as one of the greatest French sopranos of the 1940s. She was married to French baritone Roger Bourdin in May 1944, with whom she can be heard in two recordings, FAUST under Thomas Beecham, and THAIS. She retired from the stage in 1970, then died 5 January, 2017, at age 98."